Objective To determine whether a 2-week methotrexate (MTX) discontinuation after vaccination improves the efficacy of seasonal influenza vaccination in patients with rheumatoid arthritis (RA). Methods In this prospective randomised parallel-group multicentre study, patients with RA on stable dose of MTX were randomly assigned at a ratio of 1:1 to continue MTX or to hold MTX for 2 weeks after 2016–2017 quadrivalent seasonal influenza vaccine containing H1N1, H3N2, B-Yamagata and B-Victoria. The primary outcome was frequency of satisfactory vaccine response, defined as greater than or equal to fourfold increase of haemagglutination inhibition (HI) antibody titre at 4 weeks after vaccination against ≥2 of four vaccine strains. Secondary endpoints included seroprotection (ie, HI titre ≥1:40) rate, fold change in antibody titres. Results The modified intention-to-treat population included 156 patients in the MTX-continue group and 160 patients in the MTX-hold group. More patients in MTX-hold group achieved satisfactory vaccine response than the MTX-continue group (75.5% vs 54.5%, p<0.001). Seroprotection rate was higher in the MTX-hold group than the MTX-continue group for all four antigens (H1N1: difference 10.7%, 95% CI 2.0% to 19.3%; H3N2: difference 15.9%, 95% CI 5.9% to 26.0%; B-Yamagata: difference13.7%, 95% CI 5.2% to 22.4%; B-Victoria: difference 14.7%, 95% CI 4.5% to 25.0%). The MTX-hold group showed higher fold increase in their antibody titres against all four influenza antigens (all p<0.05). Change in disease activity was similar between groups. Conclusions A temporary MTX discontinuation for 2 weeks after vaccination improves the immunogenicity of seasonal influenza vaccination in patients with RA without increasing RA disease activity. Methotrexate (MTX) is the most commonly prescribed DMARD for the treatment of RA due to its high efficacy and favourable safety profile. Even in the era of biologic DMARDs, MTX remains as the anchor drug because of its synergistic effect with biologic DMARDs.7 However, MTX significantly decreases vaccine response to pneumococcal and seasonal influenza vaccines, particularly response to novel strain antigens.6 8–11 We previously showed in a pilot study, where MTX was discontinued for 4 weeks in different periods with respect to trivalent seasonal influenza vaccination, that a temporary discontinuation of MTX after vaccination could significantly increase immunogenicity in patients with RA who had been on a stable dose of MTX.12 However, a 4-week discontinuation was associated with an increased risk of RA flare by up to 1.4-fold during the 16-week follow-up period, suggesting that a shorter MTX discontinuation strategy may be desirable. Based on this pilot study, we hypothesised that a 2-week discontinuation of MTX after vaccination would be as effective as the 4 weeks of discontinuation while minimising a flare risk. Therefore, we investigated the effect of MTX discontinuation for 2 weeks after vaccination on the response to seasonal influenza vaccination in patients with RA in this randomised controlled clinical trial. This was a prospective multicentre randomised investigator-blind parallel-group intervention study that aimed to investigate the effects of a 2-week MTX discontinuation on vaccine response to 2016–2017 seasonal influenza vaccination in patients with RA. A pilot study was conducted to estimate the efficacy and time of temporary MTX discontinuation to improve vaccine response. In the pilot study, MTX discontinuation for 4 weeks before vaccination did not improve vaccination response, whereas MTX discontinuation for 2 weeks before and after vaccination or for 4 weeks after vaccination improved vaccine response. Therefore, the period of 2 weeks after vaccination were considered a critical period, where MTX should be held in the current study (online Supplementary figure S1). Patients were recruited by their primary rheumatologists in outpatient clinic setting in three tertiary medical centres in South Korea. The first patient was recruited on 7 October 2016 and the last on 7 January 2017. The study was registered with www.clinicaltrials.gov, protocol number: NCT02897011. The study was conducted in accordance with the principles of the Declaration of Helsinki and Good Clinical Practice guidelines. Written informed consent was obtained from all patients before enrolment in the trial. Patients with RA who were aged 19 years or older and had been on the same dose of MTX for 6 weeks or longer were eligible for inclusion. RA was defined according to the revised 1987 American College of Rheumatology criteria.13 The exclusion criteria were pregnant or lactating women, patients with a previous anaphylactic response to vaccine components or to an egg component, evidence of an acute infection with temperature >38°C at the time of vaccination, history of Guillain-Barré syndrome or demyelinating syndromes and previous vaccination with any live vaccine 4 weeks before or any inactivated vaccine 2 weeks before start of the study. Patients who necessitated a change in their RA treatment regimen within 4 weeks before enrolment and patients with any other additional rheumatic disease except for secondary Sjogren’s disease were also excluded. Medical Research Collaborating Center (MRCC) at Seoul National University Hospital generated a randomisation table that was stratified by centres. MRCC was not involved in the other processes of the trial. The eligible patients were randomly assigned to continue MTX or to discontinue MTX for 2 weeks after vaccination by a Central Interactive Web Response System (IWRS) at a 1:1 ratio according to the randomisation table. Information on the intervention was concealed from the investigators who enrolled or assessed the study patients. Investigators who performed the haemagglutination inhibition (HI) antibody titre assay were masked to the allocated treatment. Because of the nature of the study, patients were not masked to intervention. To measure the adherence to the study protocol, study participants were required to record their MTX administration in a diary. The 2016–2017 seasonal quadrivalent influenza vaccine (GC Flu, Green Cross, South Korea) contained four antigens: 15 µg of A/California/7/2009 Reassortant virus NYMC X-181 (H1N1), 15 µg of A/Hong Kong/4801/2014 NYMC X-263B (H3N2), 15 µg of B/Phuket/3073/2013 (B-Yamagata) and 15 µg of B/Brisbane/60/2008 in a 0.5 mL prefilled syringe. The vaccine was delivered as a single intramuscular injection in the deltoid muscle by healthcare providers. After vaccination, patients in the MTX-continue group continued their MTX in their current dose, whereas patents in the MTX-hold group suspended it for 2 weeks and then resumed it at previous dose. Before (week 0) and at 4 weeks after vaccination, the serum of the patients was collected. The HI antibody titres against each of the four influenza strains in the vaccine were measured in duplicate by an independent laboratory (the Vaccine Bio Research Institute of the Catholic University, Seoul, Korea) according to standard procedures. The average of the duplicate measurements for each antigen was used for analyses. Adding or changing DMARDs were not allowed until postvaccination serum was obtained. During MTX discontinuation, acetaminophen (650 mg up to three times per day), non-steroidal anti-inflammatory drugs (in standard dosing) and/or prednisolone (or its equivalent) up to 10 mg per day were allowed to treat RA flares. Medications for other comorbid conditions were allowed. All analyses were conducted according to a predefined protocol. The analysis population was the modified intention-to-treat (mITT) population that included all study subjects who received the influenza vaccine and in whom both prevaccination and postvaccination HI titres were available. The safety was summarised for all participants who received the vaccination. In a prior pilot study, the satisfactory vaccine response to a trivalent seasonal influenza vaccination (defined by greater than or equal to fourfold increase in HI antibody in ≥2 of three influenza vaccine antigens) in patients with RA continuing MTX and those patients holding MTX treatment for 4 weeks were 54% and 71%, respectively.12 Assuming that 2 weeks of MTX discontinuation would improve the vaccination response to that seen in patients who discontinued it for 4 weeks and assuming an alpha level of 0.05 (two-tailed), a power of 0.80 and dropout rate of 20%, 160 patients per group would be required for the study with a total target number of 320 patients. Continuous variables were analysed by using a t-test. For vaccine titres, the reciprocal of HI titres were log-transformed for group comparisons. The binary secondary efficacy variables (frequency of satisfactory vaccine response and frequency of disease flare) were analysed by using Χ2 tests or Fisher’s exact test, as appropriate. P value <0.05 was considered to indicate statistical significance. All analyses were performed by using SPSS V.20. We enrolled 320 patients with RA (159 in MTX-continue group and 161 in MTX-hold group) between 7 October 2016 and 9 January 2017. All patients received the vaccination. Three patients in the MTX-continue group and one patient in MTX-hold group withdrew their consent and were excluded from analysis. Accordingly, 316 patients (156 in the MTX-continue group and 160 in the MTX-hold group) were included in the mITT population (figure 1). Patients were predominantly female (82.7% in the MTX-continue group and 87.5% in the MTX-hold group). The mean age was 52.2 years for the MTX-continue group and 53.7 years for the MTX-hold group. The two groups did not differ at baseline in terms of demographic or disease characteristics, including seropositivity for rheumatoid factor (RF) or anticyclic citrullinated peptide antibody (ACPA) or DAS28-C-reactive protein (CRP). The groups were also comparable in terms of their treatment regimen at baseline, including their use of systemic corticosteroids and MTX dose (table 1). Patient flow. MTX, methotrexate; mITT, modified intention-to-treat. Higher proportion of patients in the MTX-hold group achieved satisfactory vaccine response, defined as greater than or equal to fourfold increase in HI antibody titre in ≥2/4 influenza antigens, compared with the MTX-continue group (75.5% vs 54.5%, p<0.001; difference 21.0%, 95% CI 10.6% to 31.7%). Similarly, the proportion achieving vaccine response (ie, greater than or equal to fourfold increase in HI antibody titre) in ≥1/4 (89.4% vs 75.6%, p=0.001; difference 13.8%, 95% CI 5.4% to 22.1%), ≥3/4 (61.9% vs 36.5%, p<0.001; difference 25.4%, 95% CI 14.3% to 36.4%) and 4/4 influenza antigens (45.6% vs 21.8%, p<0.001; difference 23.8%, 95% CI 13.4% to 34.3%) was higher in the MTX-hold group than the MTX-continue group (figure 2). Frequency of vaccination responses to the influenza antigens. Satisfactory vaccine response, defined as greater than or equal to four fold increase of haemagglutination inhibition antibody titre at 4 weeks after vaccination against ≥2 of 4 vaccine strains (A) and against ≥1 of 4, ≥3 of 4 and 4 of 4 vaccine strains (B). Numbers in the bars indicate the percentage of satisfactory responders. Error bar represents 95% CI. P values were generated by Χ2 test. MTX, methotrexate. 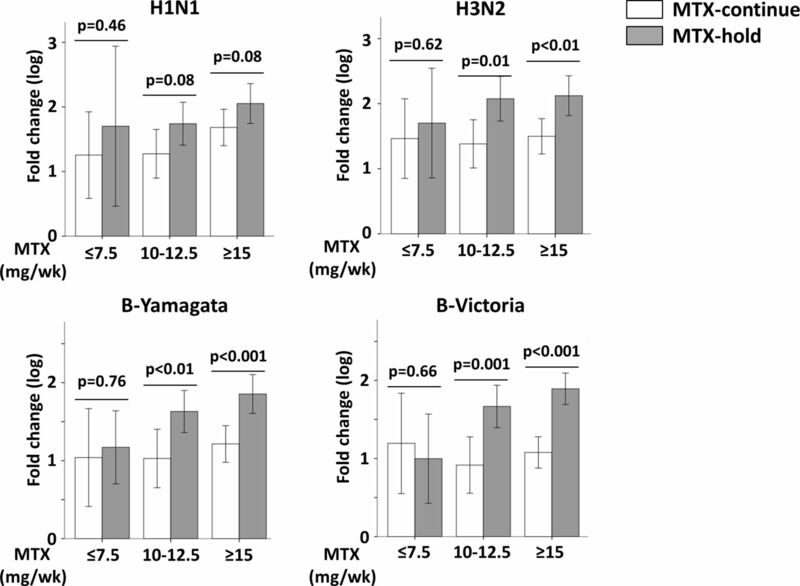 In terms of the responses to individual vaccine antigens, the MTX-hold group showed a higher frequency of satisfactory response to all four influenza antigens than the MTX-continue group (H1N1: difference 11.9%, 95% CI 0.9% to 22.8%, p=0.033; H3N2: difference 16.8%, 95% CI 6.1% to 27.4%, p=0.002; B-Yamagata: difference 22.7%, 95% CI 11.7% to 33.7%, p<0.001; B-Victoria: difference 32.8%, 95% CI 21.8% to 43.6%, p<0.001). Compared with the MTX-continue group, the MTX-hold group had significantly higher fold increases in their antibody titres against all four influenza antigens (table 2). The overall baseline seroprotection against all four influenza antigens appeared to be similar between the both groups (table 2). Postvaccination seroprotection rate was higher in the MTX-hold group than the MTX-continue group for all four antigens (H1N1: difference 10.7%, 95% CI 2.0% to 19.3%, p=0.016; H3N2: difference 15.9%, 95% CI 5.9% to 26.0%, p=0.002; B-Yamagata: difference 13.7%, 95% CI 5.2% to 22.4%, p=0.002; B-Victoria: difference 14.7%, 95% CI 4.5% to 25.0%, p=0.005). When the patients were divided into those with and without seroprotection, the response to individual antigen was higher in the MTX-hold group than the MTX-continue group in the subgroup without baseline protection (defined as HI antibody titre was <1:40 against the respective antigen), whereas the difference between both groups is less dominant in patients with seroprotection at baseline (online Supplementary table S1). The difference in vaccine response did not differ between patients in the MTX-continue group and MTX-hold group who took MTX 7.5 mg per week or less, whereas the difference was significant between the patients in the MTX-continue group and MTX-hold group who took MTX 15 mg per week or more (figure 3). Impact of baseline methotrexate (MTX) dose on vaccination responses to the influenza antigens. Log-transformed fold change in antibody titre against each vaccine strain relative to baseline was depicted according to the baseline MTX dose per week (mg/week). Bar and whiskers represent mean and SD, respectively. P values were generated by t-test. 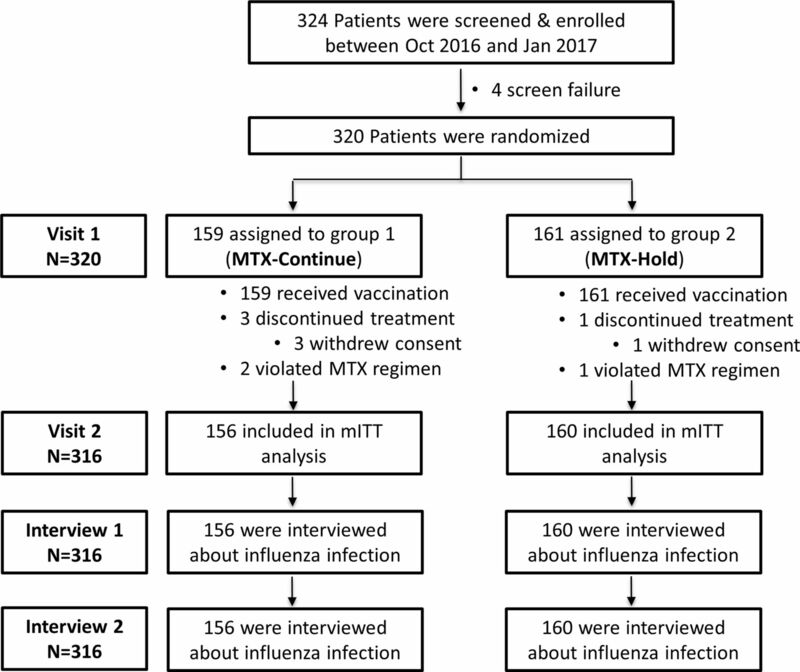 During the follow-up period up to 1 year, one (0.6%) of 160 patients in the MTX-hold group and three (1.9%) in the MTX-continue group developed an influenza-like illness. The vaccine was well tolerated. No serious adverse events related to the vaccination were reported during the follow-up period. In regard to RA disease activity, the mean DAS28 was only by 0.1 higher from baseline in both MTX-continue group and MTX-hold group (0.0±0.7 vs 0.1±0.8, p=0.365). However, eight (5.1%) of 156 in the MTX-continue group and 17 (10.6%) of 160 patients in the MTX-hold group experienced a flare during 4 weeks after vaccination (p=0.07). During the follow-up period, seven (4.5%) in the MTX-continue group and 10 (6.3%) patients in the MTX-hold group required rescue medications for increased joint pain (table 3). However, none (0%) of the eight patients with a flare in the MTX-continue group and three (17.6%) of 17 patients with a flare in the MTX-hold group used a rescue medication. Sensitivity analysis to assess the primary and secondary endpoints in all patients who had no MTX-protocol deviation (the per-protocol population) provide almost identical observations to the main analysis (online Supplementary figure S2 and table S2). Here, we demonstrated that MTX discontinuation for 2 weeks after vaccination significantly increases the immunogenicity of a seasonal influenza vaccine in patients with RA, who had been on a stable dose of MTX, without significantly increasing risk of disease activity. In our previous pilot work, vaccine immunogenicity of trivalent influenza vaccine was significantly improved in patients with RA on stable dose of MTX, when MTX was suspended for 2 weeks before and 2 weeks after vaccination or 4 weeks after vaccination but not when it was suspended for 4 weeks before the vaccination.12 A significant beneficial effect of MTX discontinuation could be definitively shown only for H3N2 strain and B/Yamagata but not for H1N1 due to the low number of the enrolled patients. This current trial done with higher subject number clearly demonstrated that even a 2-week discontinuation of MTX after vaccination significantly improves immunogenicity in all four strains of the quadrivalent influenza vaccine (H1N1, H3N2, B-Yamagata and B-Victoria) (table 2). In addition, holding MTX improved the vaccine response especially in those patients taking higher MTX dose (figure 2), indicating inhibition of vaccine response by MTX is dose dependent. Strikingly, improvement in satisfactory vaccine response was more prominent for the less exposed type B viral strains; response increased by 11.9% for H1N1% and 16.8% for H3N2 strains while it increased by up to 22.7% for B-Yamagata and 32.8% for B-Victoria strain (table 2). These results suggest that this MTX discontinuation strategy might be more crucial for response to influenza viruses relatively new to humans. Influenza pandemics occur when influenza strain undergoes major antigenic changes. Currently, influenza infections with avian H5N1 and H7N9 viruses with a reported mortality of 40%–60% have been rising in Asian countries.20 21 The MTX discontinuation strategy therefore could be even more important when patients with RA should be vaccinated against these novel influenza strains. Further studies are needed to evaluate whether this short-term MTX discontinuation can be applied to other vaccines which has low immunogenicity such as herpes zoster. Patients tolerated the influenza vaccination well without a major complication. The profile of adverse events was similar between the MTX-continue group and the MTX-hold group. In regard to disease activity, the mean disease activity remained stable. However, at the individual level, 10.6% of the patients in the MTX-hold group and 5.1% in the MTX-continue group experienced a flare (table 3). All patients with a flare returned to their baseline disease activity when MTX was resumed. The higher flare rate relative to stable DAS28 change might be, in part, due to the flare definition which defines as an increase in DAS28 of >1.2 or >0.6 if the baseline DAS28 was ≥3.2. Therefore, smaller change in DAS28 in patients with baseline DAS28 >3.2 was considered a flare, although patients might not feel a clinical difference. Accordingly, none (0%) of the eight patients with a flare in the MTX-continue group and three (17.6%) of 17 patients with a flare in the MTX-hold group used a rescue medication, reflecting the relatively stable DAS28 during the study duration. However, the patients in this study had very low activity at baseline and the risk of flare could be higher in patients with higher activity. The study has several limitations. First, all patients are Korean ethnicity. However, the clinical characteristics are similar to those in RA populations, and vaccine efficacy in our population is similar to that in other influenza vaccine studies.8 12 22 Therefore, the result might be generalised to other ethnic groups. Second, the current population was composed of stable patients with RA with a mean baseline DAS28-CRP of 2.2 in the MTX-continue group and 2.3 in the MTX-hold group. This low disease activity might be a result of target-to-treat approach in routine clinical practice.23 Therefore, the study population might be more similar to the general RA population than patients in clinical trials which include patients with higher disease activity. However, further studies testing the generalisability of our results to patients with moderate to high disease activity or with other ethnicities are warranted. Third, our study was not powered to detect a difference of influenza incidence between the two groups. A large-scale prospective study is needed to confirm whether the improved immunogenicity of MTX discontinuation can be translated into a decreased influenza incidence. In conclusion, a temporary discontinuation of MTX for 2 weeks after vaccination improves the immunogenicity of a seasonal influenza vaccine in patients with RA on stable dose of MTX without appreciably increasing disease activity. We deeply thank Professor Roy Fleischmann for his critical comments on the manuscript and Ji Hyun Kim for her excellent assistance in conducting this trial. We also thank all the study participants for their support of the study. Centers for Disease Control and Prevention. Asian Lineage Avian Influenza A (H7N9) virus. 2017 https://www.cdc.gov/flu/avianflu/h7n9-virus.htm. Prevention CfDCa. Highly pathogenic Asian Avian Influenza (H5N1) in people. 2017 https://www.cdc.gov/flu/avianflu/h5n1-people.htm. Contributors All authors contributed to the acquisition, analysis or interpretation of data and critical revision of the manuscript for important intellectual content. EBL had full access to all of the data in the study and takes responsibility for the integrity of the data and the accuracy of the data analysis. EBL, KLW and JKP were responsible for the study concept and design and drafting of the manuscript. EBL, JKP, YC and KLW were responsible for the statistical analysis. Funding This study was sponsored by GC Pharma (formerly known as Green Cross Corporation) Yongin-si, South Korea. The funder of the study had no role in study design, data collection, data analysis, data interpretation or writing of the report. The corresponding author had full access to all the data in the study and final responsibility for the decision to submit for publication. Competing interests EBL has acted as a consultant to Pfizer and received research grants from Green Cross Corporation and Hanmi Pharm. Ethics approval The study was approved by the institutional review board of the Seoul National University Hospital (IRB 1608-158-787).